In Piura, the climate is tropical arid, warm all year round, with a hot season from December to April, and a relatively cool season from June to November. 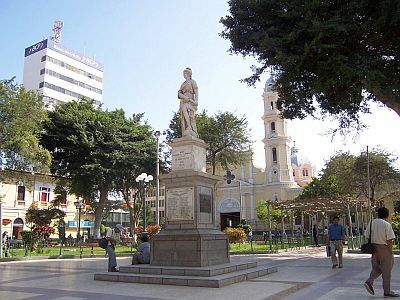 Piura is located in northern Peru, 45 kilometers (28 miles) away from the coast and 5 degrees south of the Equator. On the coast, the cold Humboldt current flows, which is capable of affecting the climate, making it much more arid than other areas located at the same latitude, and a little cooler. However, in Piura the distance from the sea is sufficient to make the heat more intense, especially from January to March, when it becomes remarkable. In winter, in July and August, it can sometimes be a little cool for a few days, with highs around 24/25 °C (75/77 °F) or even lower. In this coastal zone of Northern Peru, which includes the regions of Piura and Lambayeque (see Chiclayo), we find the Sechura Desert; the landscape in the region is in fact practically desert, except in areas where the rivers flowing from the Andes are used to irrigate fields; to find somewhat green areas, you have to go to the east, at the foot of the Andes. Precipitation is usually very poor, in fact it's lower than 100 millimeters (4 inches) per year, however, from January to April rare rains occur, which in the years of El Niño, the phenomenon of an abnormal warming of the waters of the Pacific to the west of South America, can become more abundant. In the most intense periods of El Niño, the rains increase considerably, becoming frequent and sometimes torrential, for example, in 1983 they totalled up to 2,355 mm (92.5 inches) from January to May, while in 1997/1998 they totalled 1,860 mm (73 in) from December to April. However, here is the average rainfall. The amount of sunshine in Piura is generally good, and it's better than on the coast, where the Humboldt current can cause more often low clouds and fogs, especially during the cool season, from June to September. Along the coast of the Piura Region there are towns like Mancora, Lobitos, Talara, Sechura and Paita, where you can swim and surf. The sea in the Piura area is normally never very warm; however, it is warm enough for swimming from January to April, while it becomes quite cool from July to November. In the years of El Niño, the sea in this area warms up a lot, so much so that it can reach 29 °C (84 °F) in the early months of the year.